The Hoopoe, Upupa epops, is a colorful bird that is found across Afro-Eurasia, notable for its distinctive 'crown' of feathers. It is the only extant species in the family Upupidae. One insular species, the Giant Hoopoe of Saint Helena, is extinct, and the Madagascar subspecies of the Hoopoe is sometimes elevated to a full species. 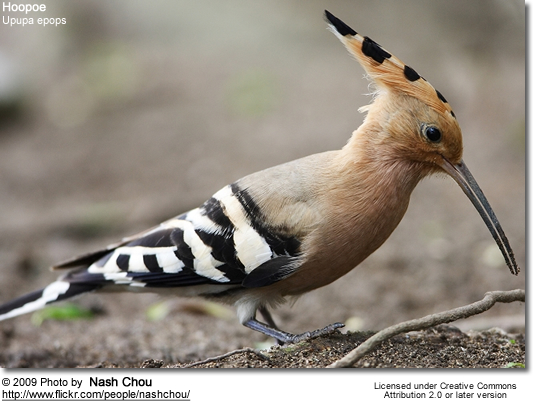 The Hoopoe is classified in the Coraciiformes clade, a group that also includes kingfishers, bee-eaters, rollers, and woodhoopoes (forming a clade with this one according to Hackett et al. (2008). 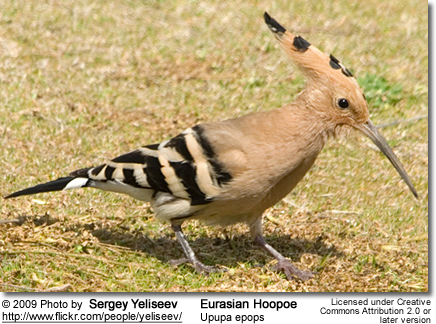 A close relationship between the Hoopoe and the woodhoopoes is also supported by the shared and unique nature of their stapes. 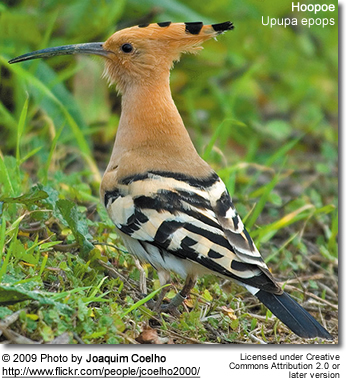 In the Sibley-Ahlquist taxonomy, the Hoopoe is separated from the Coraciiformes as a separate order, the Upupiformes. 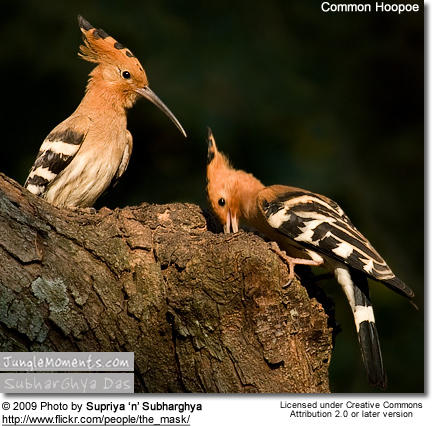 Some authorities place the woodhoopoes in the Upupiformes as well. The fossil record of the hoopoes is very incomplete, with the earliest fossil coming from the Quaternary. The fossil record of their relatives is older, with fossil woodhoopoes dating back to the Miocenes and those of an extinct related family, the Messelirrisoridae, dating from the Eocene. It is the only extant member of its family, although some treatments consider some of the subspecies as separate species. Several authors have separated the Madagascan subspecies (U. e. marginata) as a separate species, and also the resident African form U. e. africana. The morphological differences between the most commonly split subspecies, U. e. marginata, and the other subspecies are minor, and only U. e. marginata has distinctly different vocalisations. One accepted separate species, the Giant Hoopoe, U. antaios, lived on the island of St Helena but became extinct in the sixteenth century, presumably due to introduced species. 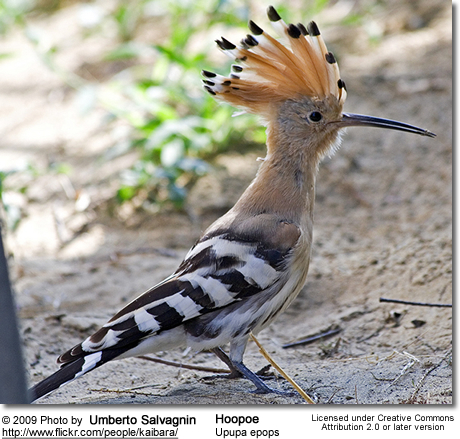 Nine subspecies of Hoopoe are recognised by the Kristin 2001 (in the Handbook of the Birds of the World), with these subspecies varying mostly in size and the depth of colour in the plumage. Two further subspecies have been proposed, U. e. minor in South Africa and U. e. orientalis in north western India. 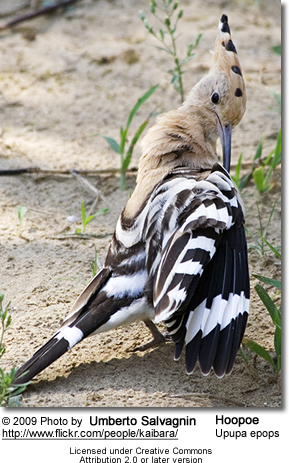 The Hoopoe is widespread in Europe, Asia, and North Africa, Sub-Saharan Africa and Madagascar. Most European and north Asian birds migrate to the tropics in winter. In contrast the African populations are sedentary year-round. The species has been a vagrant in Alaska; U. e. saturata was recorded as being seen there in 1975 in the Yukon Delta. 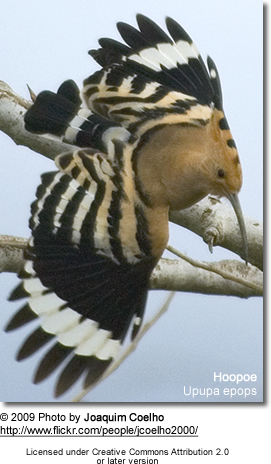 Hoopoes have been known to breed north of their European range, and in southern England during warm, dry summers that provide plenty of grasshoppers and similar insects, although as of the early 1980s northern European populations were reported to be in the decline possibly due to changes in climate. The Hoopoe has two basic requirements in its habitat; bare or lightly vegetated ground on which to forage and vertical surfaces with cavities (such as trees, cliffs or even walls, nestboxes, haystacks, and abandoned burrows) in which to nest. These requirements can be provided in a wide range of ecosystems and as a consequence they inhabit a wide range of habitats from heathland, wooded steppes, savannas and grasslands, as well as glades inside forests. The Madagascar subspecies also makes use of more dense primary forest. The modification of natural habitats by humans for various agricultural purposes has led to them becoming common in olive groves, orchards, vineyards, parkland and farmland, although they are less common and declining in intensively farmed areas. Hunting is of concern in southern Europe and Asia. 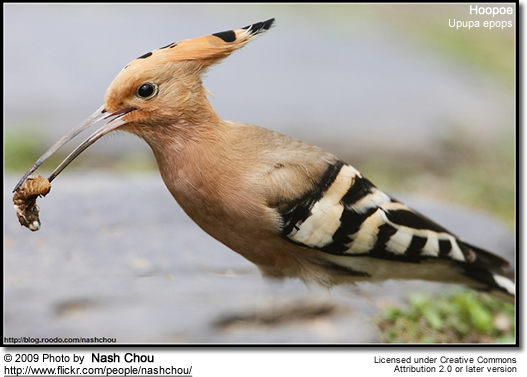 The Hoopoe has established a sedentary population in Dhahran, Saudi Arabia. They can be seen dipping for insects on the lawns of the houses located on the Saudi Aramco camps in the area. 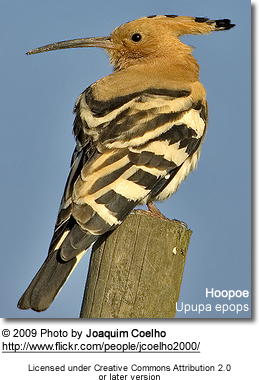 During a morning walk in September 2009, five Hoopoe were observed. The Hoopoe is a medium sized bird, 25–32 cm (9.8-12.6 in) long, with a 44–48 cm (17.3-19 in) wingspan weighing 46-89 g (1.6-3.1 oz). The species is highly distinctive, with a long, thin tapering bill that is black with a fawn base. The strengthened musculature of the head allows the bill to be opened when probing inside the soil. The hoopoe has broad and rounded wings capable of strong flight; these are larger in the northern migratory subspecies. The Hoopoe has a characteristic undulating flight, which is like that of a giant butterfly, caused by the wings half closing at the end of each beat or short sequence of beats. The diet of the Hoopoe is mostly composed of insects, although small reptiles and frogs as well as some plant matter such as seeds and berries are sometimes taken as well. It is a solitary forager which typically feeds on the ground. More rarely they will feed in the air, in pursuit of numerous swarming insects, where their strong and rounded wings make them fast and manoeuvrable. More commonly their foraging style is to stride on relatively open ground and periodically pause to probe the ground with the full length of their bill. Insect larvae, pupae and mole crickets are detected by the bill and either extracted or dug out with the strong feet. 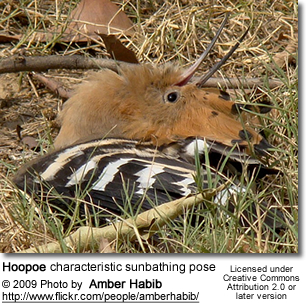 In addition to feeding in soil Hoopoes will feed on insects on the surface, as well as probing into piles of leaves and even using the bill to lever large stones and flake off bark. Common diet items include crickets, locusts, beetles, earwigs, cicadas, ant lions, bugs and ants. These can range from 10 to 150 mm in length, with the preferred size of prey being around 20-30 mm. Larger prey items are beaten against the ground or a preferred stone in order to kill them and remove indigestible body parts such as wings and legs. The Hoopoe is monogamous, although the pair bond apparently only lasts for a single season. They are also territorial, with the male calling frequently to advertise his ownership of the territory. Chases and fights between rival males (and sometimes females) are common and can be brutal. Birds will try to stab rivals with their bills, and individuals are occasionally blinded in fights. The nest is in a hole in a tree or wall, with a narrow entrance; it may be unlined or various scraps may be collected. The female alone is responsible for incubating the eggs. Clutch size varies with location, with northern hemisphere birds laying more eggs than those in the southern hemisphere and birds in higher latitudes having larger clutches than those closer to the equator. In central and northern Europe and Asia the clutch size is around 12, whereas it is between four in the tropics and seven in the subtropics. The eggs are round and milky blue on laying but quickly discolour in the increasingly dirty nest. They weigh 4.5 grams. A replacement clutch is possible. The incubation period for the species is between 15 and 18 days. During incubation the female is fed by the male. The incubation period begins as soon as the first egg is laid, so the chicks are born asynchronously. The chicks hatch with a covering of downy feathers, by around day days feather quills emerge which become adult feathers. The chicks are brooded by the female for between 9 to 14 days. The female later joins the male in the task of bringing food. The young fledge in 26 to 29 days and remain with the parents for about a week. 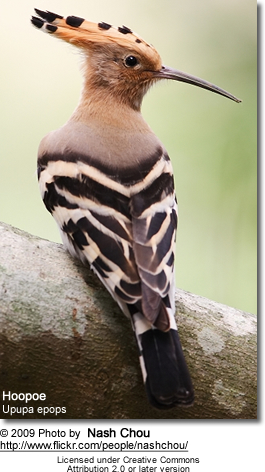 Hoopoes are distinctive birds and have made a cultural impact over much of their range. They were considered sacred in Ancient Egypt and symbols of virtue in Persia. In the Bible, Leviticus 11:13-19, they were listed among the animals that are detestable and should not be eaten. They were thought of as thieves across much of Europe and harbingers of war in Scandinavia. In Egypt they were “depicted on the walls of tombs and temples”; they achieved a similar standing in Minoan Crete. 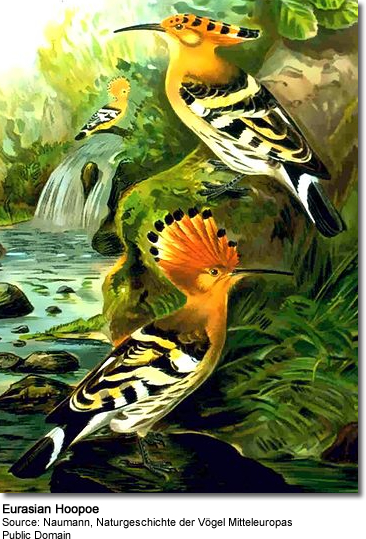 Hoopoes also appear in the Quran in Surah 27:20-21 in the following context "And [one day] he Solomon looked in vain for [a particular one of] the birds; and so he said, : "How is it that I do not see the hoopoe? Or could he be among the absent? [If so,] I will punish him most severely or will kill him unless he bring me a convincing excuse! " The diet of the Hoopoe includes many species considered to be pests by humans; for example the pupae of the processionary moth, a damaging forest pest. For this reason the species is afforded protection under the law in many countries. In Ovid's Metamorphoses, book 6, King Tereus of Thrace, married to Procne, rapes his wife's sister, Philomela and cuts out her tongue. In revenge, Procne kills their son Itys and serves him as a stew to his father. When Tereus sees the boy's head, which is served on a platter, he grabs a sword but just as he attempts to kill the sisters, they are turned into birds—Philomela into a nightingale and Procne into a swallow. Tereus himself is turned into an epops (6.674), translated as lapwing by Dryden and lappewincke (lappewinge) by John Gower in his Confessio Amantis, or hoopoe, in A.S. Kline's translation. The bird's crest indicates his royal status and his long, sharp beak is a symbol of his violent nature. English translators and poets probably had the Northern lapwing in mind, considering its crest.